One of the sectors missing in my dividend portfolio has been REITs, primarily because my portfolio has been built in a taxable account and it is recommended to hold REITs in a tax-advantaged account. To address that gap, my plan has been to establish my REIT holdings in a new Rollover IRA that is being funded via a lump sum distribution from an old employer pension plan that has become fully vested. Unfortunately, there have been a few snafus with that process and it is taking longer than anticipated. Despite knowing that the rollover is going to take at least another 4-6 weeks based on the distribution date from the employer plan, I’ve continued to keep an eye on the REITs that have been on my watch list. 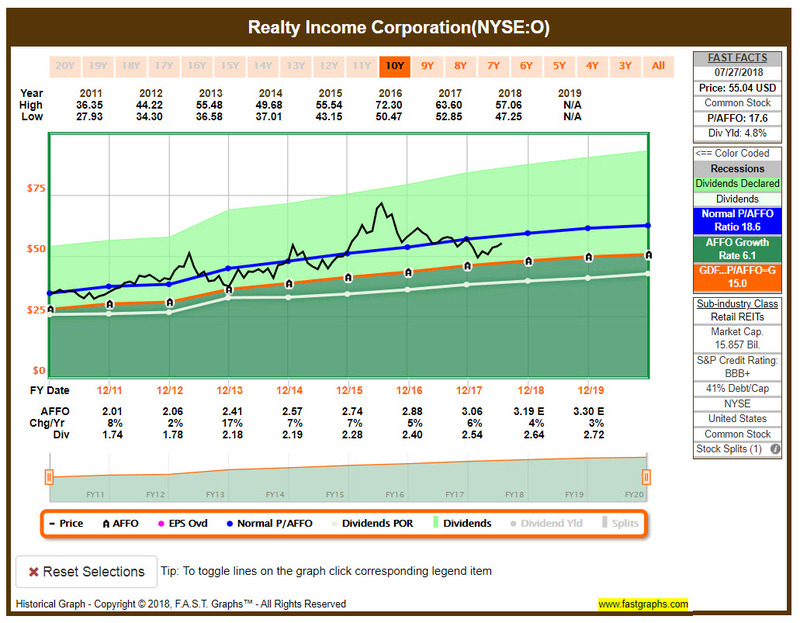 The one that has been getting the majority of my attention lately is Realty Income Corporation (O). In many people’s eyes, Realty Income is one of the staples for anyone that desires exposure in the REIT sector. They are known as the “monthly dividend company” and have an impressive 25+ year history of paying an increasing dividend. Realty Income would have been included in my portfolio from the beginning if I were investing in a tax-advantaged account, and after missing out when the price had dropped down around $53/share earlier in the month I decided on a new plan of action. Years ago I had experimented with a trading approach based on seasonality–which at the core is about analyzing the trends that stocks tend to have over certain periods of time every year. Needless to say that experiment was largely a failure, however the funds were still invested in a few non-DGI stocks in an old Roth IRA at TD Ameritrade. The new plan of action that I decided upon was to sell a portion of those holdings to have a little “dry powder” to invest in Realty Income. I didn’t sell off everything in that account as I have been allowing my younger son to use that account to begin learning about investing and researching stocks to buy–and giving him the green light to make real trades as he sees fit. Realty Income tends to trade in a fairly narrow range, and I decided that a dip below $55/share would provide a good entry point and entered in a limit order. The 31 shares will add $81.84 in forward dividend income to my portfolio. One of the normal guidelines that I look at before buying a stock is for a P/E ratio below 20, however with REITs you also want to look at the price to adjusted funds from operations (P/AFFO). Taking a look at Realty Income, they have a historical normal P/AFFO ratio of 18.6 and are currently trading at a 17.6 P/AFFO ratio which supports my feeling that an entry around $55/share is a fair value. 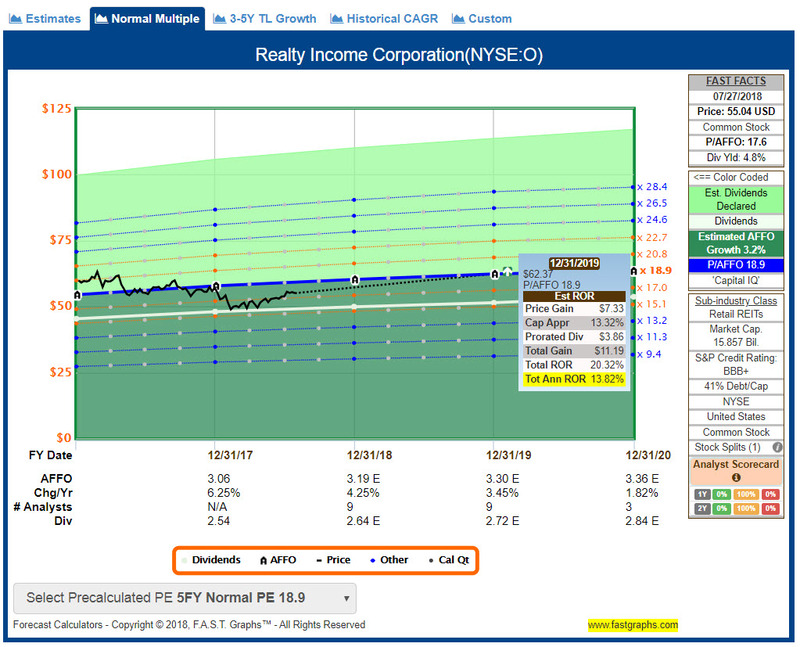 Utilizing some of the charts and features within F.A.S.T Graphs, I took a look at their forecast calculator to see what the return would look like if Realty Income moves back towards their normal P/AFFO ratio. The chart below shows a total annual ROR of 13.82% if they are able to return to that ratio by the end of next year. Certainly there are no guarantees, and that is only representative of the potential forecast. However, with my focus on dividends, I am not too concerned with that forecast as long as they continue to pay out that dividend like clockwork on a monthly basis. Over their 25+ year history of paying an increasing dividend, they have typically had 2-3 dividend increases–albeit very minor increases–throughout the year. The 7-year average dividend growth rate is 5.9% which like my recent purchases of AFLAC and Johnson & Johnson is a nice and steady growth rate for a company with a long track record of increasing their dividend. One of the features that I’ve enjoyed using as part of my F.A.S.T Graphs trial has been their performance results. The information below dynamically updates based on the time period you select on the chart, and it provides a review of how your investment would have performed in comparison to an investment in the S&P 500. While that may not always be an appropriate comparison for dividend stocks, it is a benchmark that many people reference so I find it interesting to review that comparison. Personally, the fact that this also includes a quick review of the stock’s dividend growth, payout ratio, and simulated YoC is also quite beneficial as these are key metrics that I am interested in as part of my purchase guidelines. As you can see above, over the 7.5 years represented, Realty Income returns over 2x the dividends received from the S&P 500 but that the annualized rate of return without dividends lags well behind the S&P 500. With the combined growth and dividends, that gap narrows and Realty Income has returned a respectable 10.1% annualized ROR. Like my other recent purchases, Realty Income may not be the most dazzling purchase but then again that really isn’t necessarily what dividend growth investing is all about either. With a long track record of paying an increasing dividend and a current 4.8% dividend yield, Realty Income will provide a nice consistent payout on a monthly basis and add over one share per year with reinvested dividends–and that will only continue to grow over time. With interest rates rising and people concerned about when the looming bear market will arrive, REITs may not be the most attractive sector to be entering. They took a beating earlier in 2018, which would have been a great entry point as many have demonstrated a nice recovery since early in the year. However, looking back at how Realty Income performed back in 2008-2009 you will see the key factor being that their dividend continued to be paid out every month and they remained consistent with their dividend increases. Overall, I am happy to have dipped my toe into the REIT sector and am pleased with an entry below $55/share. 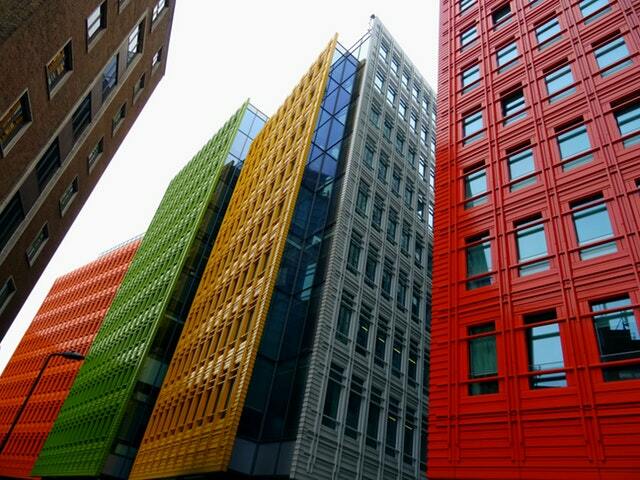 What do you think about Realty Income and/or REITs in general? Yeah, I would have liked this even more under $54 but it’s been trading in a tight range for a few weeks now so I decided to jump in. I’m planning to add more once my pension rollover completes. What is the price you’re looking to get? Appreciate your feedback; I’d definitely enjoy adding more below $50/share as well. I bought O 3 times this year in January/February when the price continued to fall. Since then, it has been a slow and steady recovery for the monthyl dividend paying company. It is always on my watch list and I’m happy to add to it any chance I get. Smart move opening it up in your Roth IRA to avoid the taxes. That’s where I hold all of my REITs. That’s great Bert! I had hoped my pension rollover would have been completed in early July and I would have been able to take advantage of the dip to ~$53/share, but I am happy that I have been able to initiate a position. The rest of the REITs that I have my eye on will need to wait until the rollover completes, as my only other option would be to sell off index funds that make up the bulk of my retirement savings. I might do that at some point, but for now I will be content with the rollover. Great to see that you’ve been a long-time shareholder of O. It definitely seems to be a popular option across the DGI community, and I am happy that I’ve finally been able to dip my toe in as well. My challenge is that my IRA options are a little limited as I don’t have new capital going into them, and don’t want to pursue a backdoor Roth given that I have a healthy nut in a tIRA that would impact the tax situation. Therefore the REITs will be much more passive as once I invest the rollover, I will essentially be limited to reinvesting dividends unless I decide to trim / sell something. Fellow shareholder here as well. Bought in at $55 but also on the dip @ $50. So I even out bij cost nicely. I love seeing my steady paycheck from O rolling in every month. That’s great that you were able to add more when it dropped down to $50. I’ve liked O for quite some time so I am happy to join the ranks as a fellow shareholder, and look forward to adding to my position. Great post buddy. I own 200 shares in Realty Income Group and very happy about that. People often look at O and get scared when they see the share dilution. At first, it’s understandable, because share diluation by def means you are entitled to a lower portion of the firms profit. However, any firm can either do share dilution or borrow money. However, for O, the question is of the share diluation makes sence and one can say that it makes sence for O to increase the numbers of shares when the share price is high (in respect to FFO). They should do buybacks when the share price is lower than FFO per share. If one checks, one can see that FFO per share has increased when O performs share dilution, and in so, it’s nice. In total, it means that the cost of borrowing is less than the future cash flow one could get from the new money, and in so, it makes sense to increase the number of shares . Thanks Stockles! I’d like to continue adding more but need to wait for that pension rollover, otherwise I would need to move out of the index funds I have in other tax advantaged accounts that have been a core part of my strategy. Unfortunately I don’t have new capital going into tax advantaged accounts other than my 401k and HSA, which don’t currently allow anything other than mutual / index funds. Appreciate you sharing that nuance regarding O and the share dilution. As I looked at that and their track record, I was not too concerned as they have clearly demonstrated the ability to make it work for them in the past. And while I know that the past is no guarantee, it is something I am comfortable with and see the benefit as you mentioned of borrowing at a lower cost.